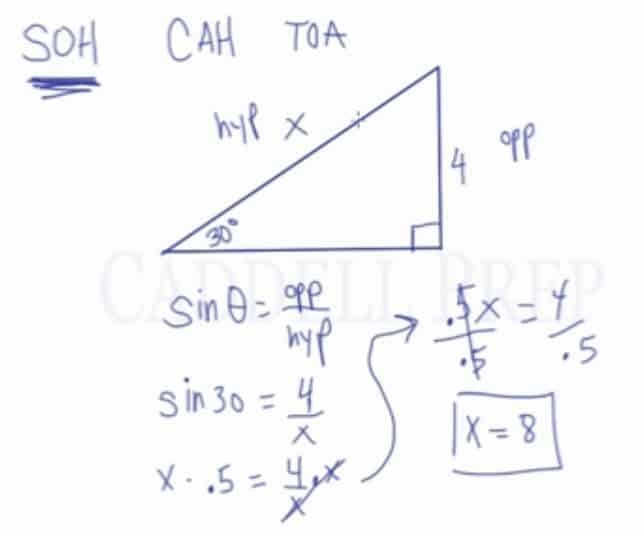 Learn how to apply sine, cosine, and tangent (SOHCAHTOA) in right triangles to solve for missing lengths or angles in a right triangle. What are the opposite, adjacent and hypotenuse in a right triangle? Note: The opposite side and adjacent side are always in reference to an angle. 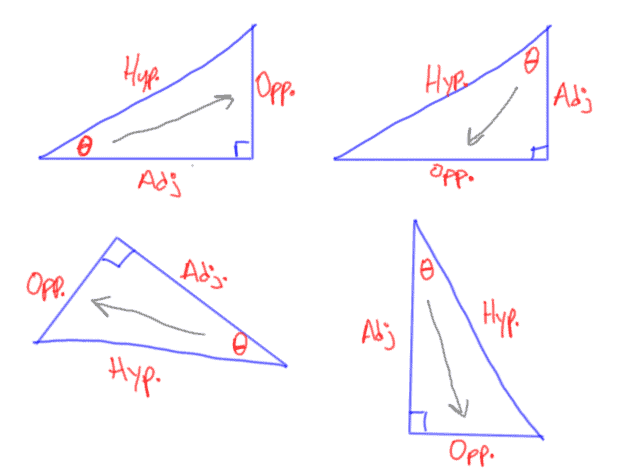 Above are four examples of identifying the hypotenuse, adjacent side and opposite side in right triangles. The opposite side is found by looking across from the indicated angle. In a right triangle, one leg has a measure of 4 units and the opposite angle has a measure of 30 degrees. Determine the length of the hypotenuse. Since the angle measure given is opposite of the side and the question asks to find the hypotenuse, sin can be used to find the missing length. In this lesson, we’ll go over basic trigonometry. So, we’re going to review sine, cosine, and tangent. A sine of an angle, a cosine of an angle, and a tangent of an angle represent ratios of sides of a right triangle. If we’re given an angle of one side, we can use one of these trigonometric functions to find the other sides. I’ll review what side is the opposite and the hypotenuse later. Let’s draw a right triangle. Then let’s define the sides. The side across from the right angle is the hypotenuse. Next, the opposite of theta is called the opposite side. And lastly, the side next to theta is called the adjacent side. We have a right triangle. One angle is angle. One side is . And we’re searching for the hypotenuse. If we have one side, we can easily use the Pythagorean theorem. But since we are missing the measurement of this side, so we can’t. Instead, we have to use one of these trigonometric relationships to figure out what the hypotenuse is. A good place to start is to write our abbreviation. So we can determine which one we’re going to use. Now, let’s figure out what sides we have. is across the angle, so that’s the opposite side. , which we’re looking for, is right across the right angle. That’s the hypotenuse. So, we’re going to use SOH. Since sine has opposite and hypotenuse in it. Now, which you can find out using a calculator or you can memorize that is . This should make sense because . That means opposite of hypotenuse is . It does make sense at the end. So in solving for one of the missing sides and we are given an angle and one side, we can usually find the other side by using sine, cosine, or tangent. First, we just have to identify what sides were given. And then write the formula and solve.